A wedding that is music themed is ideal for any music loving couple. You can take your theme as far as you want even turn your wedding into a musical production. However, you may prefer a more low-keyed ceremony and simply incorporate music symbols into the wedding decorations. Music speaks to the heart and lifts the spirit like no other media. You do not have to have musical training or a musical background to appreciate the way music inspires, stirs memories and makes you feel. People everywhere play music to relax or stimulate their thinking. At a wedding, music is a powerful tool the couple can use to tell their unique love story. Take a music theme beyond a good soundtrack; implement it into your decorations and the food you serve to guests. Begin designing your music wedding theme by picking an appropriate theme. Which song would you say is "your song?" What are your favorite genres of music? Do either of you play an instrument? What memorable songs have been special parts of your relationship? From these questions, gauge the responses from the couple by listening and watching them. Make suggestions using the responses they are most excited about. For example, if they agree on which song was their special song, use that as the theme. If they do not have a significant song but both love classic rock, create a theme using that genre of music. The theme choice will be dependent on the couple's musical tastes. Once you have chosen a musical theme for your wedding you need to incorporate the theme. Convey your musical idea with your decoration choices and other unique ideas. Incorporating your theme throughout the many facets of your event will make the big day that much more memorable for you, your spouse and the guests. Decorations: Decorations like centerpieces, an entryway arch and table decorations will make your theme sizzle. Choose a main image to incorporate throughout your scheme. This may be a musical note, a particular instrument or a dancing couple in silhouette. Shop for plastic resin images to tuck into centerpieces and have the images printed on napkins and cups. Cake toppers: Besides the bride and groom, the cake is the star of the show. Dress up the top of your wedding cake with a wedding cake topper that fits your theme idea. A guitar playing couple or a waltzing bride and groom are some examples of a themed cake topper. Wedding favors: Wedding favors make loving mementos of your wedding. 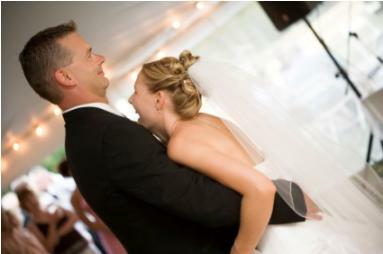 Guests would love receiving a CD containing your wedding reception playlist so they can relieve the memories over again. Alternatively, you might create a CD wedding favor that contains a few favorite songs and a recorded "thank you" message from the bride and groom. Playlist: Don't leave the music to the DJ. Weave your theme throughout the playlist. For example if your music theme is "Beach Boys," they should be a large part of your reception playlist. For the wedding service, don't get stuck with the typical. Use your theme idea to choose songs that work with your theme. Choose a song for the bride march, background for the vows and the presentation. The recessional song should be upbeat and may be the theme song you chose. Love Me Tender: This song by Elvis Presley is perfect for a decorating theme using electric guitars and old 45 records. Love's Theme: Use the instrumental version for a theme wedding. Place music stands on the center of the guest tables and place sheet music from the song on the stand. You're the One That I Want: Go Grease on the guests with this frolicking duet from Olivia Newton-John and John Travolta. Add poodle skirt centerpieces made from cake and mini leather jacket key chains as wedding favors. A fun activity would be to have the couple sing karaoke or lip-sync to this song. Unforgettable: Get classy with this song from Nat King Cole. Use starry night decorations to accompany your unforgettable evening. Ice sculptures in the shape of musical notes make fabulous touches for a wedding. At Last: Etta James' classic song is a powerful tribute to love. Choose an At Last theme with some white orchids and silver flutes. What a Wonderful World: Louis Armstrong was not only a great singer, but talented trumpet player. Use golden trumpets along with this loving song in your decorating scheme. Musical Notes: If you want to share a general love for music, create a theme using shiny black musical notes. Musical note decorations are widely available and go perfectly with any other color, especially red. Jazz: Use a jazz theme to have a New Orleans style wedding. Have a jazz band play a variety of tunes to dance by at your reception. Choosing a jazz theme will give you the perfect excuse for incorporating some Cajun flair to the food and music, or to introduce some Roaring '20s touches into the decorations and dance choices. Classical: Elegant and smooth, a classical music theme will give your wedding an air of sophistication. Use bubble machines at your reception to give you a classical atmosphere. Decorate with wedding columns and soft lighting. A musical theme will set a wedding apart from all others in the wedding season. Use music and musical touches for fun and festive details.